Financial Service Group wanted to make a personal appeal to their potential clients. They wanted to know about their ambitions, not their portfolios – a novel approach in an industry that is often cold and calculated. President Michael Haubrich was looking for something differential – he was not content with being just another financial institution. Needless to say, Envy Creative was excited to tackle such a tough project and were pumped to be collaborating with such a forward-thinking organization. That was the first question Envy asked Financial Service Group. Michael and his staff understood their clients very well, but not in how they spend their time navigating the web. Envy Creative developed an online questionnaire to ask FSG’s clients how they interact with the web and what they are looking for in a new FSG website. The responses gathered in this stage were indespinsible when it came to building the new Financial Service Group website. Communicating clearly online with your potential and current clients is great, but if you can relate to their experience, that makes for a stunningly effective website. 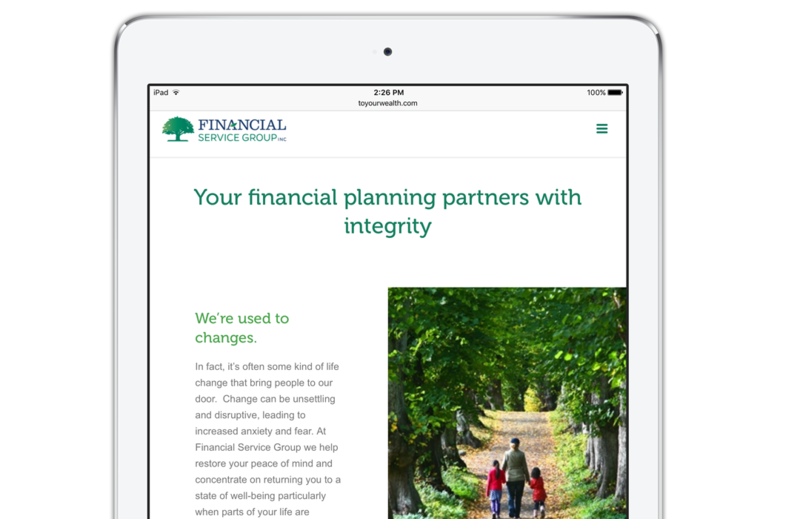 Through collaboration with the brilliant team at Financial Service Group, Envy Creative was able to create a secure web experience that was welcoming, informative, and more personal than FSG’s competitors. Need a web refresh? We want to be part of your team. We can help give you the web presence that you’ve always wanted. Our dedicated team of designers and web experts are ready to get to work for you. Reach out to Envy Creative today. We love an opportunity to talk about any project.